Movember is over. I hate growing a mustache. Hate it a lot. Even though we raised the most money in our corporate network location (couple thousand dollars) and even though I once grew one for a play in high school. I hate it. I feel like a different person. Gumpier. Older. It's depressing. A beard helps a little, but not much. At least the beard make me feel a little evil. 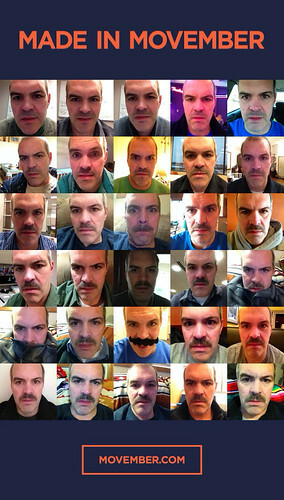 I did use the Movember app this year, so you can see my mustache progression. Don't I look more tired in the end? It has nothing whatsoever to do with being long overdue for a vacation at that point. Here's the larger version so you can really appreciate the stache. And here it is, growing in time lapse, stop motion-ness. I've included slow, medium, and fast so you can get through it at a speed you're comfortable with. And a speed of 0 is an appropriate choice.